Opening a new restaurant is probably one of the most exciting things you will ever do. It's wonderful to see all the behind the scenes stuff like writing the initial business plan, choosing the right location and picking the perfect name, all come together. But there were also areas that I wish I could do over – especially when it comes to outfitting a new restaurant. It is easy to overspend in certain areas, such as equipment, supplies, and even advertising. Your restaurant start-up budget may seem quite generous at first, but it doesn’t take long for it to dwindle. Here are some areas that are often overspent by novice restaurant owners, who think bigger and newer equals better. A restaurant equipment showroom is much like a car dealership showroom - shiny, new and dazzling… and as soon as something leaves the showroom floor it immediately loses value. This is the case with brand new ranges and grills and coolers. You can often buy gently used restaurant kitchen equipment at the fraction of the new price, saving you a sizeable amount of start-up cash. Many equipment items are also available for lease, such as ice machines and dishwashers. Leasing saves you money up front and if the items break (ice machines always seem to break) you don’t have to worry about paying to fix it. While linen tablecloths won’t set you back too much initially, the time and expense associated with their maintenance will add up over time. 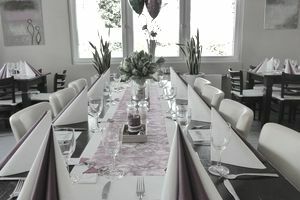 Tablecloths are nice for formal events, like weddings or other catered functions, but not necessary for everyday dining. Many fine dining establishments eschew linens in favor of nice tabletops. Instead of linen tablecloths, you can use linen napkins, which are easier to launder and store, while adding a nice touch of formality, without all the upkeep. Facebook, Twitter, Pinterest, Instagram, Tumblr…plus traditional print, and radio….there are so many places that can help you advertise for a new restaurant that it’s overwhelming. It may be tempting to hire someone to manage your social media accounts and advertising budget, but try to hold off until you are little more established. A soft opening allows you to work out the kinks of your new restaurant. Instead of moving ahead with five or six social networking profiles, plus a website (more on that below) focus on just one or maybe two social media sites, such as Facebook and Twitter. Once you have a handle on these social media profiles, you can add others, when you are ready. There is no need to shell out thousands of dollars upfront for a new website. A well-managed Facebook page can double as your website, in the beginning, offering the basics like your restaurant’s hours, phone number, location and directions, and even your menu. But keep in mind that at some point you will want to invest in a nice website for your new restaurant. Even though there are businesses, such as food trucks, that skip having any kind website, a traditional stand-alone restaurant can benefit from a good quality website, which allows for services like online reservations, gift cards, merchandise as well as showcase photos of your restaurant and menu items, a website is the cleanest, most efficient way to do that.